Ah, life as a twenty-something. Whether you’re a college student, a recent graduate, or a newlywed nesting in your first place together, chances are you’re not in the most spacious of living quarters at this point in your life. And while a dorm room, small apartment, or starter home can actually be quite cozy, living in a petite space means that you have to get creative with your storage. My husband and I recently found out that we are expecting our first baby! As you can imagine we are over-the-moon excited, but that also means that it’s time to clean out all the odds and ends we had lying around our extra bedroom to make room for baby. And since it’s also that time of year to do a little spring cleaning, I thought my tips might help the rest of you, too. No matter what your current living situation is, being efficient with your storage will maximize your space and keep you organized. No one likes staring at cardboard boxes or ugly plastic storage bins. 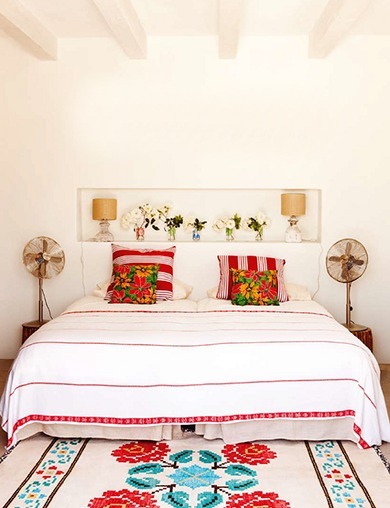 For storing odds and ends in plain sight, look for chic containers that blend right in with your décor. 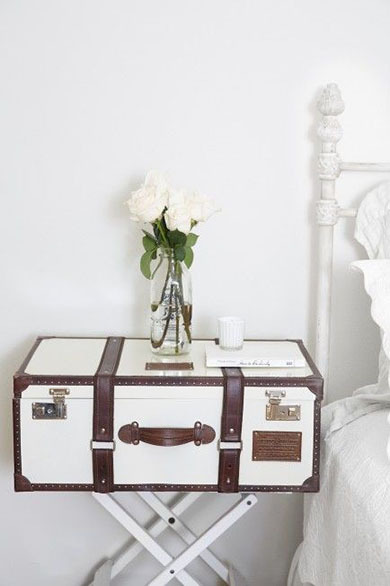 Trunks like these ones from The Little Market are great for travel, but my favorite use for them is stylish storage. These handmade cases are so gorgeous that no one will ever know what you have inside. Stack them or place them on a stand, and then you also have a chic surface to set your drink on. Beautiful hand-woven baskets and storage benches are some of my other favorite decorative disguises. My second storage tip is to make use of spaces that you can’t see. For things like winter coats and knitsthat you won’t need for several months to come, you might as well hide them under your bed or in another covert spot. Lauren swears by vacuum bags for under-the-bed storage. Not only do they protect against dust, mold, and odor, they truly maximize your storage space by sucking out any air from the bag. It’s important to be strategic when organizing your storage. Things you need frequently should be stowed where you can easily access them. 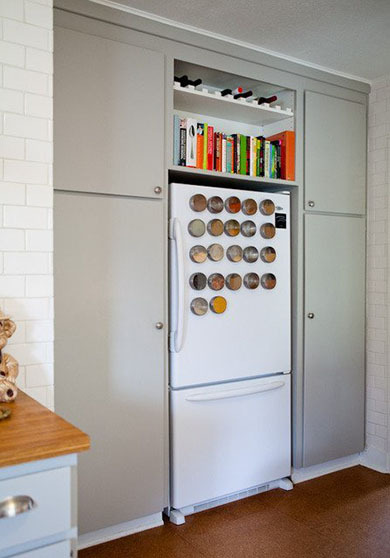 Things you rarely use can go in those hard-to-reach top cabinets or tucked away in the garage. 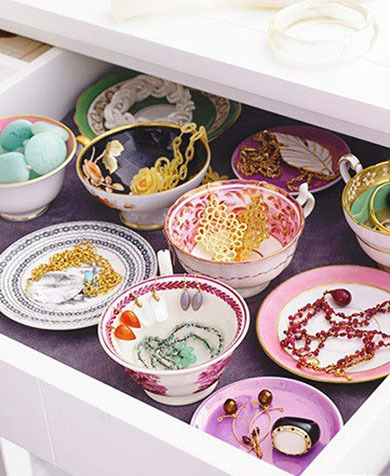 I adore the idea of using vintage teacups to store jewelry and other trinkets, which Lauren wrote about here. So cute and creative. 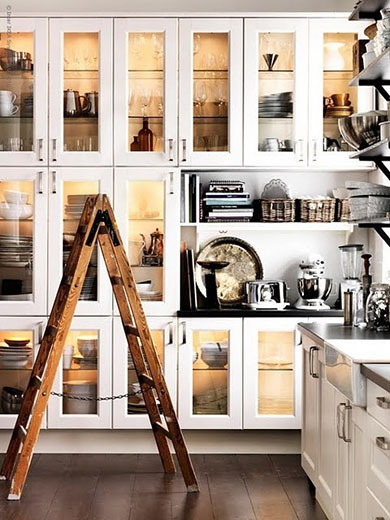 No room in your kitchen for a spice rack? Simply store your spices on the fridge in magnetized containers. 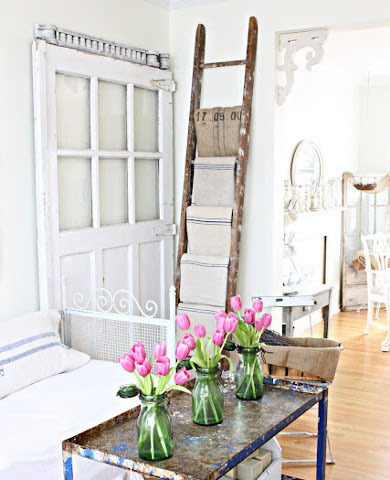 If you’re short on closet space, a vintage ladder can store towels and other linens in style. 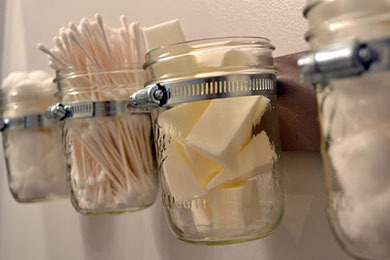 Mounting mason jars on the wall will free up valuable bathroom drawer space. 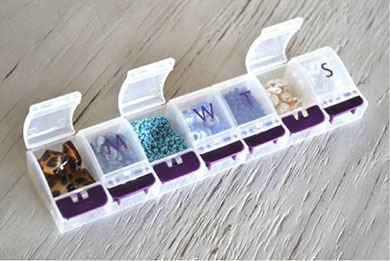 As I shared in this craft supplies organization post, weekly pill organizers are a great place to store beads, pins, and other bits.